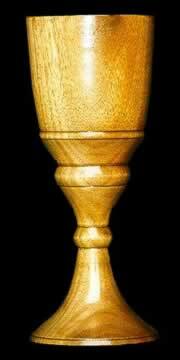 Goblet: a drinking vessel with a base, bowl, and stem. Pretty boring, huh? Well, not any more! These are the same thing in name only. Take centuries of woodturning designs, add some modern twists and beautiful wood, and you have the makings of a drinking vessel you can be proud to hand down to future generations. Available in singles, or sets of any size. They can be simple or elegant, tall or short; and they are available in a variety of hardwood choices. Need hints on ordering? Try here. 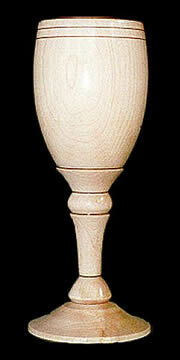 the average goblet should hold approximately6- 8ounces of your favorite cold beverage, and stands about 8 inches tall. We are currently not accepting orders. Shown here in hard maple. Its whimsical ball stem and the ring below the bowl, imitates the Jesters props which were used to amuse all feasters during their meals. An excellent addition to any table. 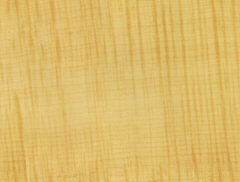 Shown here in hard maple. A wide and generous bowl, with a stable low foot. Certainly a goblet befitting a Royal feast, or even the most ordinary table setting. Truly a regal choice that will serve a lifetime. Shown here in hard maple. Slim and lovely as it's namesake, this design has a delicately beaded stem and a bell shaped bowl. The elegant grace of this shape has long been a favorite for weddings, both as toasting goblets, and gifts for the wedding party. Shown here in hard maple. A favorite shape among champagne fanciers, the light foot, and slim bowl lend a certain grace to any occasion or toast. Shown here in black walnut. From the upswept lines of the foot, to the generous bowl, this goblet style is truly a crowd pleaser. One of our best selling designs, it is sure to provide many years of loyal service, just as a squire would have served his knight. Shown here in maple. This strong design will serve to please even the most discriminating taste, with it's layered foot and deeply scooped stem leading the eye upwards to the flared bowl. A wonderful addition to any table. Shown here in hard maple. A joy to hold, and a pleasure to use, this design shows off the natural beauty that can be found in all woods. Imagine, if you will, a set of these gracing your table the next time the boss comes to dinner. © This site created and maintained by Woollybear Web Design. Copyright 1998-2014. All rights reserved.